Soccer, or also known as football in some countries, is a massively known sport. Millions of people play the game, and billions of people watch it. Its reach is so vast that it is known that over 250 countries participate in the sport. Known to be thousands of years old, it is an understatement to say that this game has been around for a long time. Due to that fact, it is no surprise that a lot of people play. Although it is more popular on the western side of the world, mostly European countries, a handful of eastern countries also take pride in their own soccer teams who not only play nationally but are also capable of playing with the giant teams of the west. If you are a fan, you at one point have probably thought of hosting your own game. If so, here are a couple of soccer game ticket templates and examples you can follow as guides. A template for a soccer game ticket with a background as green as the landscape on a soccer field, this is definitely a fitting ticket for a soccer game. Simple yet vibrant. You just sort of feel the essence and influence of the sport just by looking at this ticket. 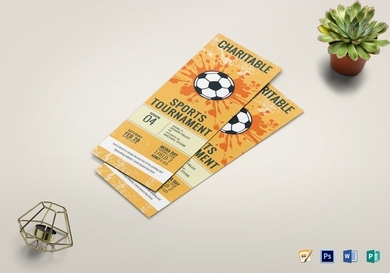 A soccer game ticket for a supposed charity game. With yellow overtones that in a symbolic way signify the grandeur of soccer games. You can use this for your own perusal if you want to recreate the majestic ambiance of a soccer game that is held in massive stadiums. A ticket for an indoor soccer game. 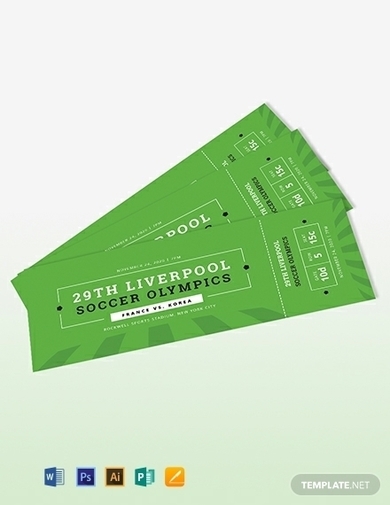 Very stylish and the color of the ticket is purposely complimentary to the logo of the participating teams. You can do this concept as well, having a ticket with color schemes and designs that match the logo of the teams for your own game. 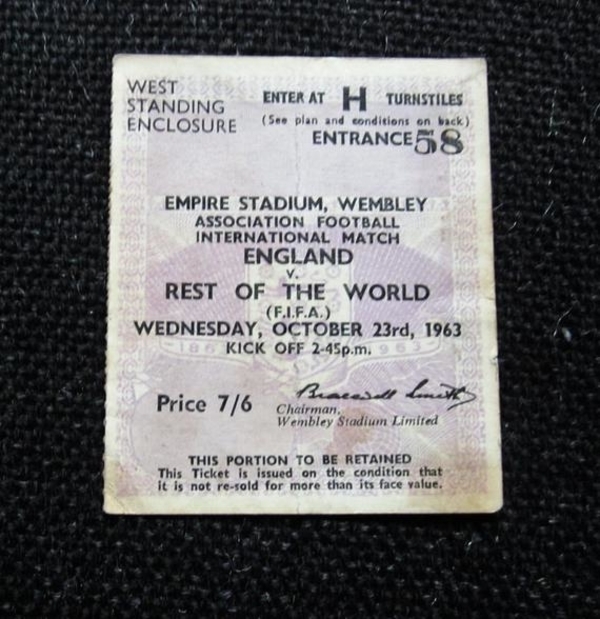 This are the ticket examples that was handed out during the 1963 England vs. Rest of the World game. This game marked the 100th anniversary of the Football Association and it was the first known game where a team from a single nation clashed against a world team. This game was reportedly watched by thousands and thousands of people. 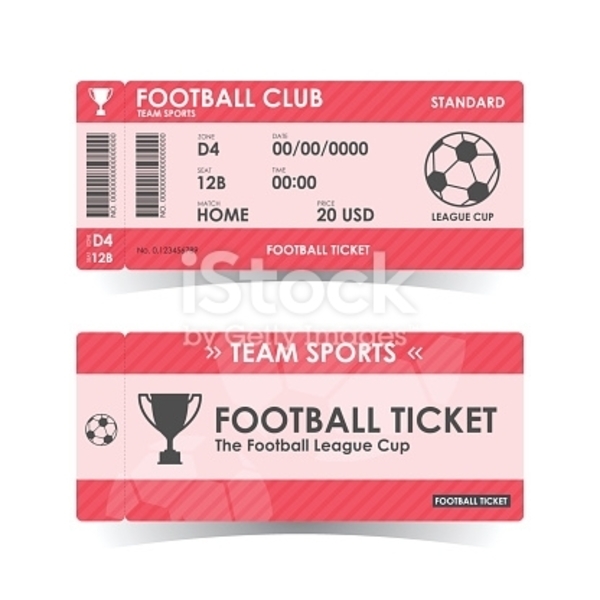 A simple-looking soccer ticket with a reddish, pinkish hue as a color scheme. Although not as design driven compared to other tickets, all that matters really is the ticket is loud and clear about what it is for, with the game, participants, time, and date all in plain view. 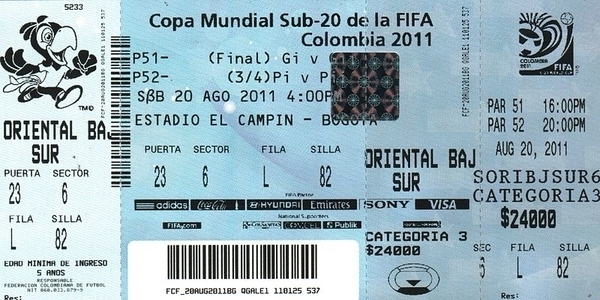 A soccer ticket for a FIFA game held in 2011. This looks like your conventional event ticket, with the participants as headers, the location, date and time, and seating number below. This is definitely a kind of ticket that one would keep as a memorabilia in honor of that game. 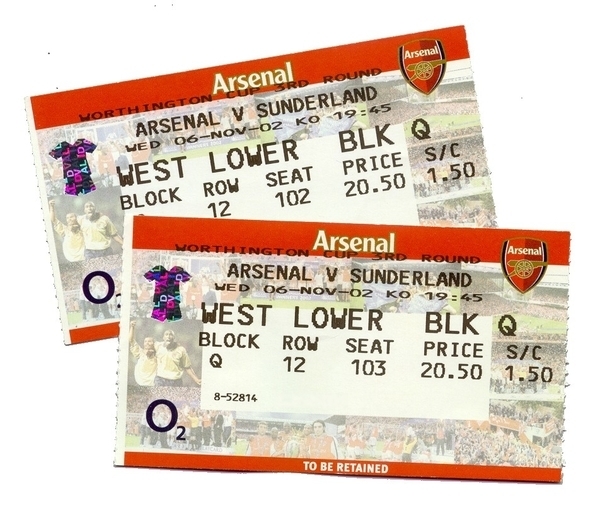 A soccer game ticket for a game that pitted the Arsenal Football Club against the Sunderland Association Football Club. The ticket itself has a strong red color as it’s main color to signify the Arsenal’s team logo due to it being the home court player. Despite that though, it turns out that the Sunderland team was the one who emerged victorious from that match. A ticket for a friendly soccer match between Real Madrid and Club America. This game was exciting to watch, as the two great nations of Spain and Mexico battle it out in a soccer field. It was just a friendly competition, of course, but exciting nonetheless. The ticket itself is plain, simple, and straight to the point, but that is not totally unheard of when it comes to professional game/sports tickets. 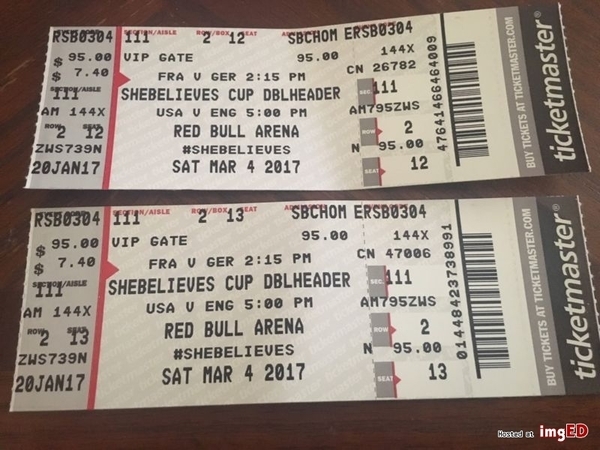 The official ticket for the 2nd She Believes Women’s Football Cup held in the United States in 2017, and had the US, Germany, France, and England’s women football teams as participants. Though this is simply a friendly cup, this was still considered the most important friendly cup of the year due to those four participants being ranked the No. 1, 2, 3, and 5 in the FIFA Women’s world rankings. To reiterate the fact that this is a women’s football cup, the ticket itself is a white, pink, and blue color scheme. Incidentally, the champion of that cup happened to be France, whose flag also share a similar color scheme, with red instead of pink. A FIFA World Cup ticket for the game of Russia vs. Saudi Arabia. 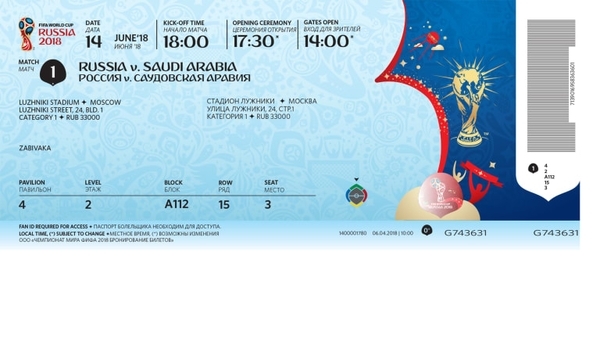 This ticket exhumes elegance and beauty, with its mainly blue color scheme, with the world cup trophy featured in the ticket. This game was an amazing game for the home team and host of the World Cup, Russia, and highly unfortunate and disappointing for the Saudi Arabia team. This game ended with Russia leading a whopping 5 to none. Be that as it may, this ticket will be held forever as a remembrance for the people who bought them and witnessed the cup. I’ve said it earlier, but I will say it again. Soccer, or football, is an extremely popular sport. During world cups, people from all around the world participate and gather with their close families and friends. Some people consider it tradition, even. That is one of the reasons why it is so beloved even by people who do not even play the sport. Parents encourage their children to play soccer. And in the school games, they become highly supportive and competitive. Sometimes even more so than the players and coaches themselves. They may all seem silly to non-sports fans, but do not take it lightly. The players themselves consider this a way of life. We should all just be grateful that this is a way for people to get together and have fun.